Wherever there is water, there are tardigrades. Strictly aquatic animals, they are found on land surprisingly often. 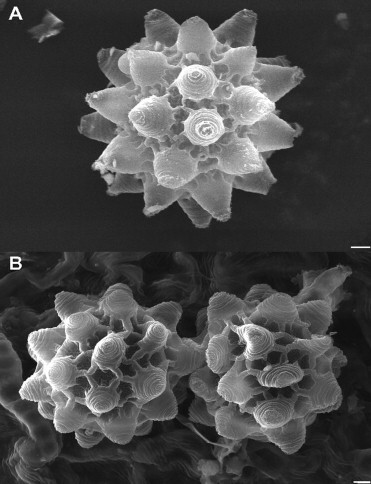 They achieve this remarkable feat by being able to survive “aquatically” with only a thin film of water around them. This simple adaptation is only the beginning of a staggering list of achievements in tardigrade evolution. They astound us repeatedly with the force of their resilience to extreme conditions. 1. They are just adorable. So adorable, in fact, that they are often called water bears or moss piglets. Moss piglets, people. Cute overload. 2. Their attempts to be aquatic on land have necessitated adaptations to the many distinctly non-aquatic situations that they often find themselves in. They have evolved ways to remain dormant, either through diapause or quiescence, to get through these trying times. A quiescent stage is induced by some change in the environment, say a highly dehydrating event, and it can be reversed by the reversal of the event. Diapause, however, is mediated from cues from within the animal’s physiology, and is not necessarily dependent on the environment itself. If you take quiescence to its very extreme, you can end up in a stage of effectively undetectable metabolic activity, enigmatically termed cryptobiosis. 3. 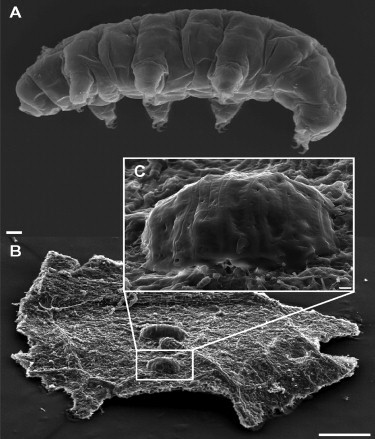 When tardigrades choose diapause to be dormant survive tough situations, they can literally become cysts. They look contracted, oval and opaque (under a microscope). 4. When they adopt cryptobiosis instead, they reveal their niftiest adaptations to date. They can survive acute desiccation (or anhydrobiosis) or stringent freezing (or cryobiosis) at any stage of their life cycle. 5. They have the most elaborate and elegant eggs that can themselves become dormant if a cause should arise. Eggs can “rest” and recover when subject to a stimulus, or, like meals-to-go today, you could just add water and voila! they are back in action. 2. Cryptobiosis allows them to live in extreme and uncertain environments, where very few other species can survive. Suddenly, there’s no real need to worry about predators, parasites or even competitors. 3. 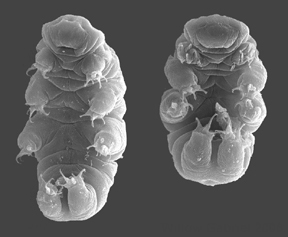 Tardigrades can “escape in time”. Where we have to migrate, they just check out of life and return when they please in the future. 4. At any given time, due to cryptobiosis, there are tardigrades somewhere in a terribly unfavourable environment, riding it out. They effectively occupy millions of these refuges, or hiding spaces, with a good portion of the individuals of a species untouched by the present. They are, in other words, far more likely to survive the Zombie Apocalypse than anyone you know. 5. They can go places no one else can. Imagine this, if you will. You’re having a bad day, you decide to just throw in the towel and become a cyst. Now you’re smaller, lighter, and insensitive to stimuli. You go where the wind blows, hitching a ride to as yet unexplored lands, and you can even get past barriers that would have stopped you while you were… more alive. If you have really read this far, you will be glad, because I saved the best for last, just for you. Tardigrades can survive in space. Yes. The same space with the solar system in it. Actual space! Concerned about the unfiltered solar radiation? No problem! What about the fact that space is, in fact, a giant vacuum? All in a day’s work, for some tardigrades. They do, however, prefer not to be irradiated as a rule. Rather a lot of them revived within 30 minutes and then tragically succumbed to serious side effects. 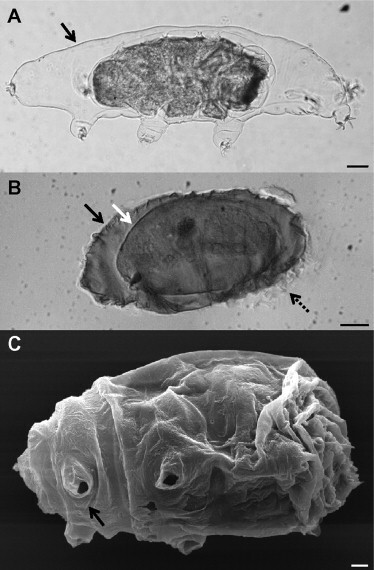 Just when you think that nothing but a tardigrade’s life will do for you, you discover that there are others who do better than tardigrades at all of the above. I give you, lichens and bacteria. Admit it, you’d rather be a tardigrade. To collect or not to collect?